Leading Supplier and Manufacturer from Jaipur, our product range includes Stone Earrings such as Wooden Round Black Ear Ring, Wooden Round Ear Ring, Wooden Ear Ring With Black Work, Indian Stone Earrings, Stone Ear Ring, Wooden Ear Ring and many more items. We are engaged in manufacturing and exporting Indian Stone Earrings. Our team provides the effective designs which are adorned with a variety of colourful stones. These earrings are widely accepted for their fine finishing work and glorious appeal. Girls cannot resist themselves from using this once they perceive Indian Stone Earrings. We make use of the supreme quality of material to maintain the standards. We offer the wide range of Stone Earrings to our value esteemed clients. 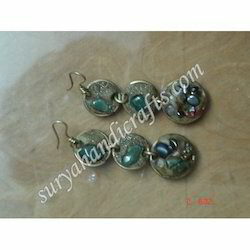 We are the widely accepted manufacturer and exporter in providing Stone Earrings. Our well experienced team provides the effective and attractive design patterns using the colourful stones. These provide an admirable look to the person when worn for parties or for some cultural occasions. The client can avail this at a reasonable price in the market. Metal Bowl In Round Shape With New Mango Wooden Top Metal In Da Grey Powder Coating Finish.